Truck Loader Crane Market size is set to exceed USD 2.5 billion by 2025; according to a new research report by Global Market Insights, Inc. The global shipments are expected to grow at a CAGR of over 6.5% from 2019 to 2025. Increasing infrastructure transformation projects and rapid development of the construction industry across the globe are the major factors driving the truck loader crane market. Several government institutions in Europe and Asia are working on national infrastructure development plans that account for an increased utilization of construction equipment. These cranes are used for efficient loading and unloading of heavy materials and bulky construction materials, eliminating human labor involvement. Due to the increased lifting capacity and longer working radius, these cranes are increasingly utilized across material handling and logistics operations in e-commerce & manufacturing sectors. The remote controllability and mobile accessibility features of new machines aid users to manage and control the material handling operations from different places, further supporting truck loader crane market growth. The truck loader crane market is rapidly evolving in several application industries such as construction, mining, material handling, rental, etc., owing to the efficient load handling capacities provided by manufacturers. The manufacturers including Palfinger, Fassi, etc., are increasingly developing efficient products that are compatible with trucks and applicable across all the application industries. A major factor hindering the truck loader crane market is the lack of skilled operators for handling the machine operations. To overcome these problems, manufacturers are also providing operator training courses that include guidance related to machine handling & weight lifting parameters. In the truck loader crane market, medium-duty machines will witness high demand of around 11% as compared to other capacity cranes owing to their weightlifting capacity and performance in both small and medium-range operations. These cranes are being utilized in workshops, warehouses, and transportation sites with the requirement to handle weight under 20 tons. The growing popularity of these machines is attributed to benefits such as installation & operational convenience over conventional cranes and the replacement of human workers in lifting tasks. Additionally, crane manufacturers are providing efficient training courses that include correct handling methods, lifting appropriate weights, attachments, etc., aiding in fueling truck loader crane market growth. 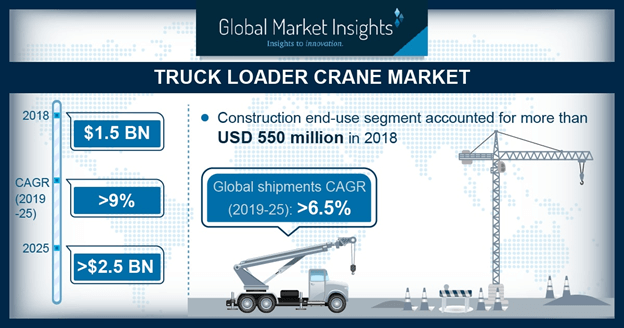 Construction sector valued at over USD 550 million in 2018 in the truck loader crane market is experiencing high traction due to the efficiency and time-saving benefits offered in loading, unloading, and material handling operations. The demand is added up by the growing infrastructure development and new residential & commercial projects in countries including China, Brazil, Germany, etc. Moreover, high government funding and investments for developing the national public infrastructure are contributing to industry’s expansion. Technical innovations and rise in the product availability from manufacturers across the untapped regions are also supporting the machinery deployment by local construction companies. The companies are also investing in R&D activities to develop cranes with technical features such as IoT compatibility and construction application-specific machines with high lifting capacities. High investments in the industrial sector and several ongoing construction projects under ‘One Belt, One Road’ initiative in China account for truck loader crane market growth prospects. The government plans to increase the infrastructure investment for protecting the country’s economy and sustainable development initiatives across the application industries, adding to the machinery consumption. However, due to the slowdown in infrastructure investments, the machinery demand is expected to fall in the coming years and a steady demand is expected in the ongoing projects. The developing Chinese material handling sector, owing to robust e-commerce and manufacturing sectors, has created a requirement for such cranes for efficient loading & unloading operations and warehouse management techniques. Owing to the increasing demand for Chinese products from other regions, the export & shipping activities have also increased, further deploying truck loader crane market products in material lifting operations. Key players operating in the truck loader crane market include Fassi, Tadano Ltd., Palfinger AG, Hiab, Liebherr Group, Manitex, Inc., Terex Corporation, Sany Group, XCMG, Hyva Group, etc. The manufacturers adopt several product development and innovation strategies to differentiate their offerings. The regional expansion and continuous mergers & acquisitions with smaller local players are a prevailing trend among leading manufacturers in the truck loader crane market. For instance, in July 2018, Hiab announced its acquisition over Effer S.p.A. loader crane business for an amount of USD 57 million. The acquisition is a part of the company’s strategy to become a global leader in the truck loader crane market.